Freya Hammond is used to people fulfilling her every whim. Wealthy and spoiled, she lives a butterfly existence of fashion and parties and is accustomed to getting her own way. Which is why the new bodyguard is riling her. Miles Murray is ex-SAS and obeys her instructions with barely repressed scorn. She can sense that he doesn't think much of her. The Hammonds have been staying at their luxurious retreat high in the Alps. Now Miles is driving Freya to the airport but the rapidly worsening weather and a near-miss with a dangerously driven jeep causes him to lose control, and sends the car plummeting off the side of the mountain. When Freya comes to, she is lying on the freezing ground, Miles beside her. The car is a mangled mess far below them. Now Freya needs Miles to save her life. Using all his survival skills, Miles manages to locate an old shepherd's hut and get them both there despite Freya's twisted ankle. Rescue will surely come before too long... but until then Freya is no longer in control. The tension between them is soon at fever pitch as she tries to dominate a man who no longer obeys her orders. And when rescue does come, how will they return to their old life of mistress and bodyguard after what has happened between them? I had been wanting to read this series for a long time, so I was thrilled when I received a copy that contained the whole story. The story centres around Freya who to start with acted spoilt and wanted everything even though she could not have it, it became clear that it was how she was bought up. It would also explain the wall she built around herself so people can't get in. The first chapter of Season of Desire had a lot of action and lot of big impact moments hat would affect the story and both the main characters as well. Along with Freya, there is Miles who is Freya's new bodyguard, one who is definitely not like the others, being ex-SAS he is trained to take orders so when he tries to follow what Freya asks of him, though that soon turns out to be a bad choice. When the weather forces them both into a situation that neither of them expected, dislike soon turns into passion, one that they can't resist. As they become closer together their lust for each other is undeniable, though they are still stranding in the middle of nowhere, hoping to get rescued when the weather lets up if it ever does. Although, getting rescued is the least of their problems, their lives will never be the same upon reflection about what happened in the time they spent together and how it changed them. They both have something to lose when it comes to being together, it just the case of are they really willing to risk it all for each other. There are many aspects that they have to consider if they want to be together, they are both so different from each other, even if they want to be together would the people in their lives allow them to have their happiness, especially Freya's family who will do anything to make sure they are not together in the end. 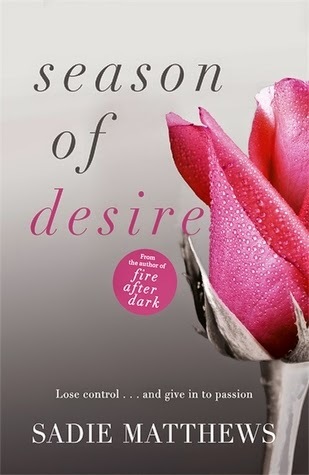 Season of Desire is a passionate love story between a rich woman and the bodyguard who is paid to protect her. All it took was one wrong move for them to see what they have been missing in their lives, with it's drama, lust, sexual contain and love it is a perfect addition to any bookshelf. If I had to sum this book up in three words, they would be Thrilling, Marvellous and Enthralling. I loved this book so much, that I didn't want it to end, I loved the characters, the storyline and the chemistry that they had together. I can't wait to read more book by Sadie Matthews, I already have one of her other books from the After Dark Trilogy that I will definitely read as soon as possible.